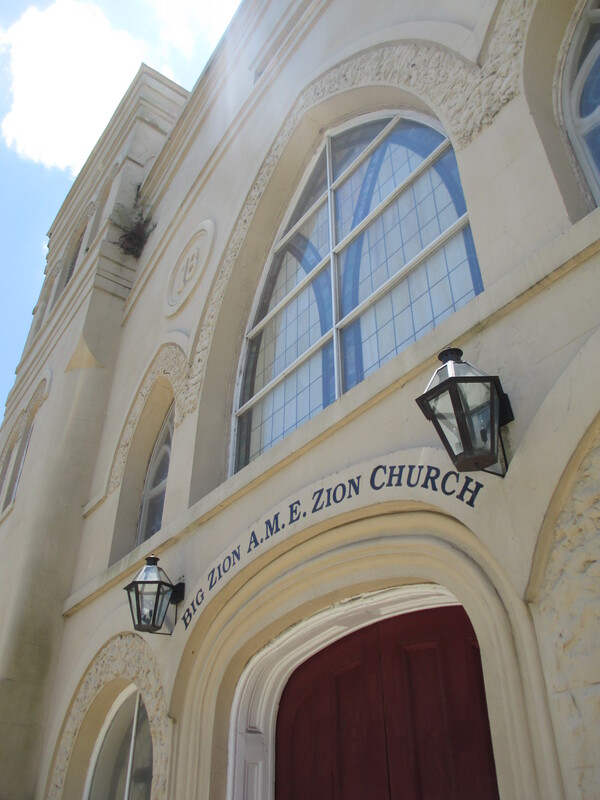 Last year I spent a wonderful Sunday morning at an African Methodist Episcopal Zion Church in Mobile, Alabama. The experience itself was interesting and enlightening for a number of reasons, but the one that keeps popping up in my head is realizing that I had approached the church with a deep and unknown racism. You see I went to that particular church because I was chasing a story I’d been told. I’d seen it in movies time and time again. Forest Gump is always the first example that comes to mind. It’s the story that in the south there are these fantastic and full congregations made entirely of black people. And their preachers are passionate. And their parishioners are enthusiastic. And most importantly, their choirs are fantastic. I wanted to visit that place, the one I’d seen in movies. I wanted to hear the choir. It hadn’t occurred to me that assuming that every predominately black church would automatically be filled with wonderful singers was racist. It is, by the way. It’s racist because I was taking a skin color and assigning an unrelated trait to it. I imagine I didn’t think of it this way because I was engaging in what’s often called “positive racism.” One example of positive racism you may have heard is the idea that Asian people are good at math. This feels like a harmless thought to have because it’s complimentary. We all wish we could be naturally good at math. But no matter the compliment, we are still stripping people of their identity as individuals and lumping them into a group defined by their race. And it quickly turns into something overtly negative: Asian people who are bad at math are seen as failures to their race, and Asian people who are good at math receive no praise because it’s assumed their race is the cause. I was envious of the black churches I saw in movies and longed to be in a place where people could be so passionate about their faith in a way that didn’t seem to attack others. I thought my assumptions were complimentary, so it never occurred to me that they were racist. That is, until I showed up and their choir was no different than choirs I’d seen at plenty of white churches. I felt a twinge of disappointment before I was overcome with shame. That moment of disappointment reminded me that disappointment can only come as a result of expectations, and the church had only failed to meet the expectations I had invented for them based on race. A few years ago I watched a TED talk by Kathryn Shulz titled “On Being Wrong.” During the talk she asked audience members what it feels like to be wrong. She told them that those are good answers, but they are answers to a different question. They are answers to the question, “What does it feel like to realize you’re wrong?” Feeling wrong, she explained, feels exactly like being right. That’s how I felt walking into that church in Mobile. I didn’t feel racist. I had an abstract appreciation that we live in a racist society and that as a member of that society I will occasionally and unintentionally engage in acts of racism, but I didn’t think I was engaging in one at the time. In fact, I never feel like I’m currently engaging in acts of racism. Why? Because if I felt that way I would stop. And that’s the key. There is a person I want to be. I try to be her everyday, and every day I fail at least a little. Because intellectually I know that I can’t possibly be right about everything, which means one day (hopefully), I’ll discover the ways in which I’m wrong. I will have a chance to change, and change is hard. Realizing you’re wrong feels so awful that sometimes you’ll fight to keep believing you’re right. You’ll twist the facts and make up excuses. Not to be malicious, but because change means admitting that all the reasoning you had to support your previous position was wrong. And you’ve been operating and living under that wrong reasoning every day of your life. There are parts of the person I am right now that will be an embarrassment to the person I will become. It’s hard to think about, because admitting it means I’m already wrong and not changing. I’m already being racist and haven’t stopped. I’ve already twisted the facts and will continue to repeat them. Not only am I doing something horrible, but I’m not fixing it. My only saving grace is my ignorance. I don’t know which thoughts are the wrong ones. Yet. 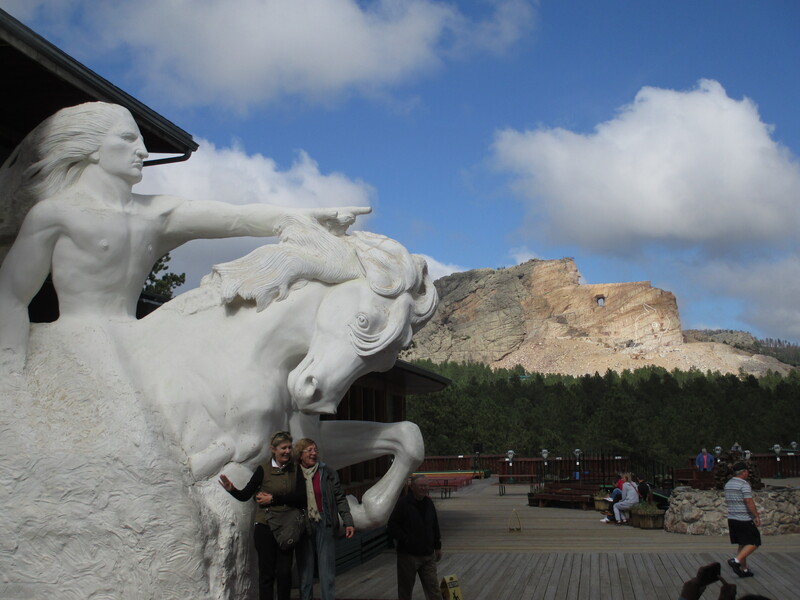 I first saw the Crazy Horse Memorial when I was nine years old. I was on vacation with my grandparents, and we went to it right after seeing Mount Rushmore. Crazy Horse is only a few minutes from Rushmore, and is intended as a mountain memorial to the great Crazy Horse, the war leader who lead the Lakota people to victory at the Battle of the Little Bighorn. I remember being so excited as a little kid. Mount Rushmore was a permanent symbol of the greatness of the past. It represented the hard work of men from decades before my time, most of whom were long dead. But Crazy Horse was a mountain in progress. I imagined being an old woman and taking young kids to go see it. I would tell them about the day I first laid eyes on crazy horse, and how back then only a bit of the face and arm had been completed. They would marvel in the way that little kids do, amazed that I could remember something so far in the past. Visiting Crazy Horse, I felt like a part of history. I was excited to come back and see it again 18 years later. I was excited to see how it had changed. I hoped that the visitor’s center was still laid out in roughly the same way, so I could remake photos that I had taken as a child. I paid my entrance fee at the gate and drove up to the parking lot. From the lot a person can get their first glimpse of the mountain, and that’s where I got mine. My heart sank. It looked exactly the same. Though work had been going on the whole time, the progress was virtually undetectable. I was filed with shame. The white presidents had their mountain made in less than 15 years, but Crazy Horse was permanently stalled. Where were the funds to remember the people who were here first? No where, it seemed. No one cared about Crazy Horse. I went into the Visitor’s Center to see the collection of local Native American artwork, and to watch the introductory video. The video told the story of one man, Korczak Ziolkowski, who started the project in 1948. 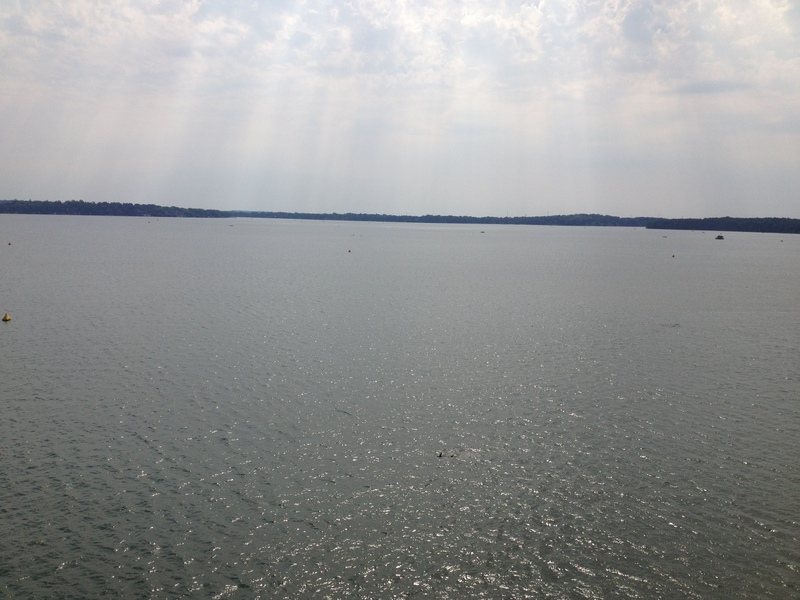 When he first began his work, Ziolkowski was completely alone. He built a log cabin near the mountain to live in, and constructed over 700 wooden stairs to get him to the top of the mountain to begin blasting. He worked alone for years before marrying a much younger woman and having 10 kids. The whole family became involved in the project. Ziolkowski’s wife was interviewed for the video, and mentioned how he had been offered federal funds of more than $10 million on two occasions, but turned them both down. “He believed you don’t stand around with your hand out waiting for the government to give you money.” I did some research online later that suggested he was also suspicious that any federal money would mean federal control, and he didn’t want to risk his larger vision. The full plan of the Crazy Horse Memorial was something my nine-year-old brain had tuned out. 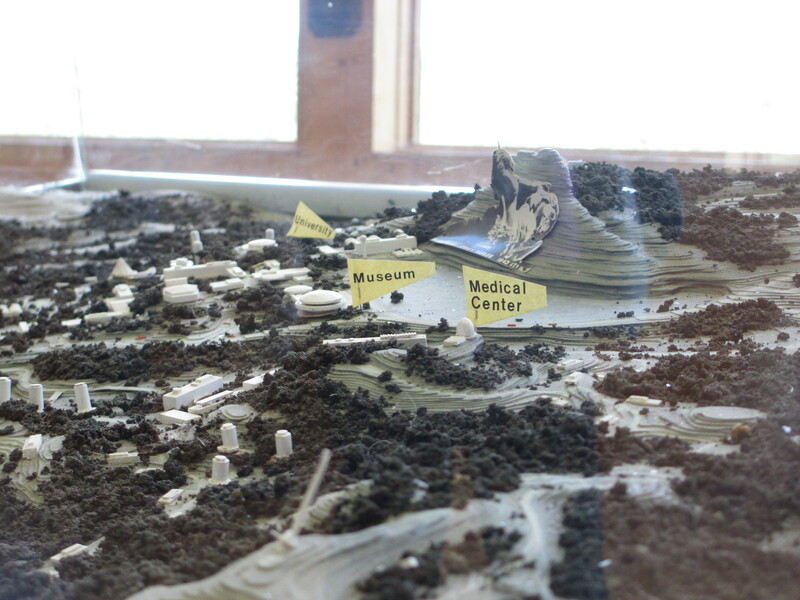 You can see the grand idea in a series of scale models inside the visitor’s center. In the shadow of the great mountain they hope to construct a university campus, a medical center, and a museum. The visitor’s center already includes the museum’s introductory artifacts, but one look at the site plans and you can see how huge the sculpture’s dream really was. I don’t mean to mock Ziolkowski’s belief in private enterprise, but it’s hard to see something remain stagnate for so long knowing the funding was there all along. The great monument to Crazy Horse looks no different now than it did 18 years ago. I even checked my memory against old photos in the gallery to be sure. While Ziolkowski is long gone, his wife, his children, and so many individuals who have become passionate about the project are forced to fight for it, and fight for it using his ideals. Outside of the occasional wealthy philanthropist, the Crazy Horse Memorial Foundation must raise all its money through ticket sales and gift shop purchases. Before leaving Crazy Horse I bought a souvenir shot glass – my small donation to the cause. Perhaps the lesson I was supposed to take away from Crazy Horse is that sometimes worthwhile work outlives those who know it to be worthwhile. At the current rate, it’s unlikely that anyone working on Crazy Horse today will live to see it’s completion. Like the pyramid builders, they must have faith that future generations will benefit from their efforts. One of my primary goals in taking this trip was to meet people who were different than me. It’s easy to get wrapped up in the bubble of your own opinions, especially in a solidly blue city like Seattle. In my everyday life, conservatives are more of a concept than a real life group of people. I can try to go online or watch TV, but I know it’s no use. There’s no way to accurately judge the slant I’m getting, no way to verify the authenticity of the opinions. Not to mention we’re all inclined to click on things that interest us, so the internet will always point you to the places in which you will find like-minded friends. I figured as long as I stayed in Seattle I was guaranteed to get constant reinforcement of my own ideals. If I wanted to be challenged, I’d have to hit the road. Unfortunately, even when seeking out The Other I couldn’t help but constantly find The Same. I didn’t have any republican CouchSurfing hosts because nearly everyone on CouchSurfing is a variation on the hippie/liberal spectrum. When I stayed with family and friends I was often among liberals, because we are all inclined to grow up believing the same things as our family members and making friends with people who agree with us. I knew my own bias was getting in the way of my desire to meet my idealogical opposites, but I had no idea how to fix it. When I expressed my dismay to my host in Wisconsin, she recommend I spend some time with her neighbor Tim. She’d had more than one political debate with him over the years, and assured me he was firmly in the Republican camp. I wasn’t sure how exactly to ask a complete stranger if he wouldn’t mind talking with me for several hours, but this problem solved itself when I went to return the bike we’d borrowed the day before, and he offered to take me on a tour of the local college campus. Madison had been over-taken by the Ironman Triathlon that day, and Tim and I ended up in his car for most of the tour as we searched for campus roads that weren’t closed. While driving we talked about capitalism and economics and I related a few stories about international manufacturing that I’d recently learned from Planet Money. He told me he thought the people still singing in the capitol building were just whining because they lost the recall election, and I explained how in Seattle, photos of the Madison protestors were shown adjacent to the Arab Spring. Tim told me about how he and his wife live in Florida for six months of the year. When they drive down they do so without stopping to sleep. It’s 27 hours to get from Madison to their home in Florida, and they do it with a dog and two cats. He said he and his wife prefer it this way; they don’t like to stop. Plus, it means they can time their drive to take advantage to low-traffic periods. They never get stuck in Atlanta traffic because they drive through the city at two o’clock in the morning. After giving up on the college and finding all his preferred dining establishments closed on Sundays, Tim and I grabbed some pizza at a local chain restaurant. Back at the house his wife handed me some homemade cookies for the road, and Tim recommended I stop in La Crosse on my way to Minneapolis. And that was my day with a conservative. I was afraid that living in a bubble of my own values was going to force me to see opposing viewpoints as crazy, and the people who held them as monsters. I wanted to go out into the world and meet these people first hand, and remind myself that they are no different than the rest of us. I wanted to hear their views straight from their mouths and gain a better understanding of where the thinking was rooted. What a moron I was. If traveling around the United States has taught me nothing else, it taught me that we are all inclined to believe that the majority of people we encounter agree with us. It is universal. It happens during casual party conversation and at the fast food counter. We carry our bias with us everywhere, and we don’t notice it because it usually doesn’t matter. It doesn’t matter if I assume the woman making my hot chocolate at the coffee shop is a democrat, because it’s probably not going to come up. It doesn’t matter if I assume she recycles regularly and would also love to visit New Zealand. It doesn’t matter because it’s unlikely any of these things will come up. I can keep believing them, and she can believe the complete opposite, and there will be no evidence of either if all we talk about is hot chocolate. Believe it or not, Libertarians and Socialists are capable of having incredibly non-confrontational conversations regarding cocoa. The real bias that I was guilty of and needing to fix was my belief that I wasn’t already surrounded by opposing views. I was afraid of turning the opposing side into a faceless other, when that’s exactly what I’d done. I didn’t need to drive 15,000 miles to meet conservatives, I meet them all the time. Most of the time I don’t notice because when not discussing politics, liberals and conservatives are (surprise) pretty much the same. I know plenty of ideologically conservative people. I just don’t talk about politics with them. Why? Because I don’t want every casual conversation to turn into a debate. And I understand that I probably won’t be able to change their mind, since I know they won’t change mine. So we don’t bring it up. During my travels I had so many polite conversations with so many people that probably didn’t know how different I was from them. We all assume other people are just like us. My conversation with Tim was very cordial, very polite. We spent most of it finding all the ways in which we agree. Because that’s what people do. When face to face we’d rather agree with each other, because it reinforces the notion that we were both right all along. All sides do it. It’s yet another way in which we are alike. And I suppose that’s the thing I drove around the country to learn. I didn’t have to go to Wisconsin to meet a conservative. Of course, I didn’t know that until I got there.